Ohio runs one of the largest workers’ compensation systems in the country. Last year, the state’s bureau of workers’ compensation (BWC) addressed over 99,000 claims for a variety of workplace illnesses and injuries. While billions of dollars were paid out to help injured workers and their families, not every workers’ compensation claim was approved. In 2016, about 11 percent of claims were denied or dismissed, equal to nearly 11,000 claims. While it can feel frustrating and overwhelming, injured workers may still have options, even after a claim is denied. It can still be possible to obtain benefits to provide important medical care and wage replacement. Every Ohio business with one or more employee must carry workers’ compensation insurance to protect employees after workplace injuries and illnesses. There are few exceptions to this rule, including sole proprietors, family farm corporate officers, partners, and limited liability companies acting as a partnership or sole proprietor. Ohio is one a few states that use monopolistic workers’ compensation system. This means that employers must purchase workers’ compensation insurance from the state or self-insure. There are no private insurance options. Either employers pay into the state fund and the state pays the benefits to the injured worker, or employers pay the injured workers directly. And the state uses managed care organizations (MCOs) to administer the care. When an Ohio employee is injured, there are certain expectations and rules. The first steps are to seek medical care and notify the employer of the injury. Depending on the circumstances, the employee may need to seek immediate care, or there may be time to notify the employer first. In Ohio, injured workers may see any provider for the initial treatment. In those cases, injured workers should let their doctor know that the injury is work-related so the provider can properly document the visit. After that, the employer will provide the employee a list of certified providers. Then, the workers’ compensation claim will be filed. The employee, employer, medical provider, or other authorized representatives can file the claim online. The state will decide to approve or deny a claim within 28 days. The injured worker will always receive a letter that states the exact reason for the denial and information regarding a possible appeal, including the timeframe for filing. Appeals start at the district level and can proceed further if necessary. At all levels, a hearing will take place within 45 days of filing the appeal. A hearing officer will hear the appeal and decide within seven days. 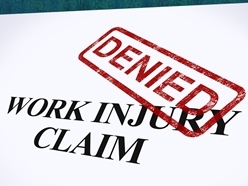 If denied again, the injured worker then has 14 days to file an appeal to the next level. The commission may refuse to hear the appeal, and the employee may pursue the matter in the court system. In those cases, employees have 60 days to file a claim. The decisions of the BWC are binding, and those decisions directly affect your well-being. The process can be adversarial, and Ohio’s injured workers deserve to have their voices heard. Even if your initial claim was denied, it's possible to obtain the benefits you deserve. If you or someone you love has suffered a work-related illness or injury, the lawyers at the Monast Law Office may help. Call our Upper Arlington workers' compensation law office today at (614) 334-4649​ to learn more about your rights and possible options.